Bloggerellies you have rocked my socks off. Thank goodness you did too as I needed my toes to count and remember the awards I needed to do this week. I’m more flustered than if I was front and centre at a Led Zeppelin concert, armpit to armpit with some die hard fans. I wonder if they’d mind if I borrowed their zeppelin to fly my awards home in. I hope you guys are up to rockin’ out with me for awhile until we get to the end of this gig. It’s gonna be a mammoth show over the next 5 days. I’m going to post two awards each day or until I pass out from the excitement of it all. Firstly, I’d like to pay homage to the blogenius who decided that it was totally cool to post the receipt of an award that one has already received; just acknowledge the person who bestowed that award upon you. I would more than likely give you my gold ticket if I knew who you were as you’ve probably saved me several hours of post-i-tis and the audience from burnt fingers after waving their lighters in the air for too long. The stage is set. Let’s rock this joint. Chopping Potatoes is what Jennifer does best. She’s got it down to such a fine art form her spuds have been Freshly Pressed. I am in complete awe of her writing style (not due to fact of the FP) because she doesn’t put starch in her posts. They’re open, honest, funny and I can relate to them. It is awesome to have received this award from you, Jennifer. Thank you. As I have already received this award I won’t post the rules here. You can find them on Jennifer’s site if you wish to take this award home with you. Pieter, a.k.a Ah Dad…, did some rocking and rolling of his own recently. He sang, ‘You Give Love a Bad Name,’ with Bon Jovi and woo hoo’ed when he reached 100 followers (I wonder if Jon has that many?). Unfortunately he’s approaching the big 4-0h, like my good self, and didn’t do so well on his hearing test. Pieter makes me laugh frequently-just don’t ask him about the air-conditioner guy. Thanks, Pieter. I’ve also received this one before so I won’t nominate-just go check Pieter out. I’ve prepared him for the hoards of adoring fans (ahem, one or two of you) who might head over there based on my perspective. Well that was a pretty easy first set. I’m all warmed up now and raring to hear what’s coming up next. I hope there’s going to be some classics in the mix. Love will be back in the spotlight after a drinks break. Compliments AND multiple references to Led Zeppelin? “Thank you” Ha! You truly are a bloggess after my own heart! 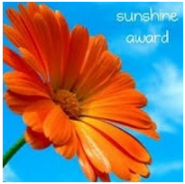 Seriously, though, you totally deserve the award for your spreading of the sunshine. And your words humble me and warm the cockles of my little heart. You are nothing short of BIG hearted. Thank you and consider me humbled by your nomination also. Thanks. It’s a payback not pay forward but still important to do. I agree!!! I hate having to choose just a couple of blogs….